Our doors are manufactured using the Spectus Elite 70 profiles. Spectus doors are manufactured to the same technical standards as the window system, providing you with all the security and insulation you would expect from modern PVC-U. Residential Doors single residential doors can be fully glazed or have a midrail. There is also a full range of decorative panels available to suit the doors. French Doors a great way to fully open up a room to provide additional lights and space. A choice of inward or outward opening. 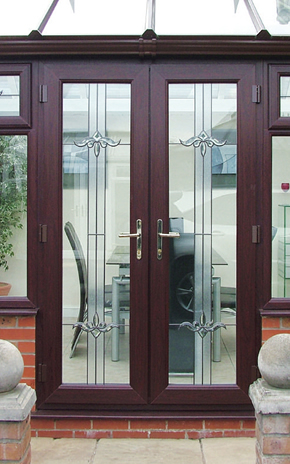 Patio Doors a choice of two, three or four pane options providing choice in the door style available. Midrails are available to provide the ability to incorporate a letterbox. Smooth sliding action. Our windows and doors provide an outstanding barrier against heat and noise loss. Windows and doors made from PVC negates the use of timber, protecting the planets trees. We recycle our own waste and generate new products whilst still retaining the highest standards in quality of material. Our windows and doors do not require painting and therefore don’t consume additional harmful materials or generate associated waste. Manufacturers and installers of windows, doors and Conservatories since 1979 offering a varied selection of quality designs to suit you and your home.